Firstly, apologies to any publishers reading this (I know some do visit my blog, and appear on it! ), the title wasn’t my mine but I do think the eBook is great, but then I could be biased… I’m one of the 40 contributing authors (I’m no.7) – see the list below. To access your free copy click here (also available at Smashwords and Amazon). To read more about it visit Hayley’s website. You’re very welcome, Salvatore. The credit of course to Hayley for putting it together. 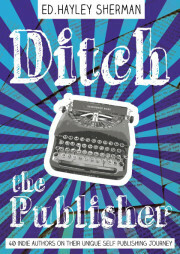 Thank you for the opportunity for the download of the Ditch The Publisher book. I started reading it as it printed and it appears that these people have experienced the same dead pan efforts from the publishers as I have. I am sporting 386 rejections as of yet, with no end in sight of publishing. If I hadn’t taken the proverbial bull by the horns and published on my own I would still be waiting for approval. Wow, that’s determination. Thank you, James. You’re so welcome, Edith. I was honoured to be asked. Wow! What an incredible line-up, from top to bottom! I am sure that I speak for many by thanking you from the bottom of my heart for all the goodness this compilation is bound to generate! Wow! I’m in awe! i am trying to self publish, it may offer lot of help. thanks a lot for sharing.